With special Facebook integration and powered with 5MP primary camera and Android 4.0 OS features, Sony Xperia Miro price in India is Rs. 14,499 (pre order online price, also best price). Sony Xperia Miro price in India will be suitable for mid category of customers like students and young professionals. Sony Xperia Miro features 512MB RAM, 3.5 inch touch screen and 800MHz processor for giving high class performance. Sony Xperia Miro specifications include 3GB of internal memory and Bluetooth, Wi-Fi and GPRS for data sharing and accessing high speed internet. Sony Xperia Miro price and features will provide mid range smartphone which is highly suitable for social networking on Facebook and multimedia applications. Sony Xperia Miro features 5MP primary camera with LED flash, auto focus and digital zoom of 4X to ensure high quality images and video recording to capture best moments of life. It has 3.5 inch TFT screen with high quality anti reflection coating with 320x480 pixel resolution. Sony Xperia Miro features internal memory of 3GB which is quite adequate to store most of files and documents and can be expanded also up to 32GB for store large no. of heavy files. Sony Xperia Miro specifications are Bluetooth v2.1 with A2DP for fast and easy sharing of data, GPRS for internet connectivity, 802.11 b/g/n and Wi-Fi Direct for wireless access to fast speed internet services. 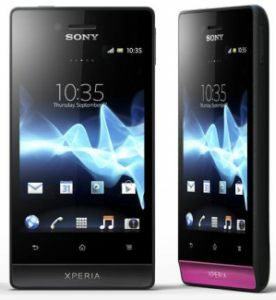 Sony Xperia Miro is 3G enabled smartphone which will ensure best quality of chatting and very fast data download services. This smartphone weighs just 110 gms and has overall dimensions of 113 x 59.4 x 9.9 mm making it highly portable and suitable for people who undertake heavy traveling. Designed in candy bar form, Sony Xperia Miro is available in four different color combinations like black, black with pink, black with silver and white with gold carved in model. Sony Xperia Miro price in India at Rs. 14,499 with 3G connectivity can be compared with other mid range smartphones like Motorola Defy Plus at price of Rs. 15,990, Samsung Galaxy Ace Duos I589 at price of Rs. 13,490 and HTC ChaCha at price of Rs. 12,499 in Indian market.